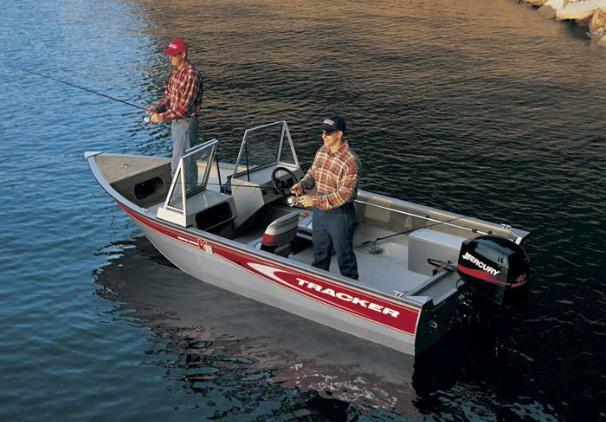 Boat Description For those of you who love to fish in not-so-big water, or those looking for the perfect starter boat, there`s the TRACKER Boats Super Guide V-16 WT. It features our tough .090 marine grade aluminum and all-welded hull with a wide bottom. The Super Guide V-16 WT offers a surprisingly spacious layout, stability and lots of storage space in the bow and side storage boxes, plus the added protection that a walk-thru windshield provides. Hidden battery storage, a large console with speedometer and stain-resistant upholstery are just a few of the many standard features that make the Super Guide V-16 WT a big-time value.